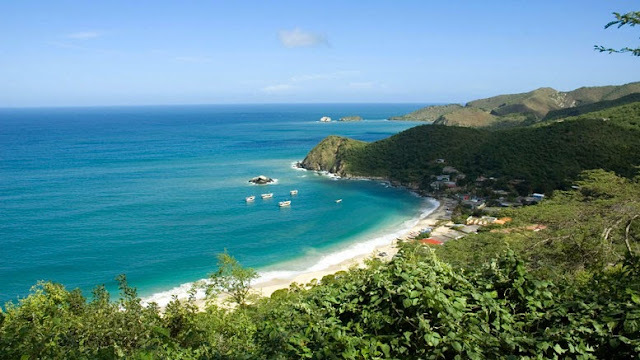 Margarita Island is the largest island in the Venezuelan state of Nueva Esparta, situated off the northeastern coast of the country, in the Caribbean Sea. The capital city of Nueva Esparta, La Asunción, is located on the island. Primary industries are tourism, fishing and construction. Christopher Columbus became the first European to arrive on Margarita Island in 1498. The local natives were the Guaiqueries people. The coast of the island was abounded in pearls,which represented almost a third of all New World tribute to the Spanish Crown. Margarita Island was fortified against the increasing threat of pirate attacks, and some fortifications remain today. In 1561, the island was seized by Lope de Aguirre, a notoriously violent and rebellious conquistador. Around 1675 the island was captured again, this time by Red Legs Greaves, a pirate known for his humanity and morality. He captured a fleet of Spanish ships off port, before turning the guns on the forts which he stormed and claimed a large booty of pearls and gold. The island gained independence from the Spanish in 1814 after the collapse of the First Republic of Venezuela. It became the first permanently free territory in Venezuela. In the same year, Luisa Cáceres de Arismendi was detained for over three years in a dungeon of the Fortress of Santa Rosa on the island in an attempt to put pressure on her husband Juan Bautista Arismendi, who was fighting for independence. Simón Bolívar was confirmed as Commander in Chief of the Venezuelan Republic on the island in 1816. From there he started a nine-year campaign to free Venezuela, Colombia, Ecuador, Peru and Bolivia from the Spanish Crown.